Before we get all moony over Godspell, consider its original off-Broadway production: When Godspell opened, in 1971, the Vietnam War was still raging. New York City was a primordial swamp of crime and poverty. Charles Manson was on trial, Hunter S. Thompson was dropping acid in Las Vegas and Jim Morrison had just died in a bathtub. In the apocalyptic zeitgeist of 1971, it seemed perfectly reasonable to see a musical about Jesus Christ dancing with a bunch of circus clowns in an empty playground. I mean, why not? Nearly 40 years later, Godspell is just as bizarre and hokey as ever -- and it's still unavoidably fun. The story is the Book of Matthew: Jesus appears, he shares some wisdom, his apostles rejoice, Judas betrays him, the Messiah is crucified. Mostly, his followers sing upbeat songs, composed by Carnegie Mellon alumni John-Michael Telebak and Stephen Schwartz. They pray. They sup. They dance constantly. 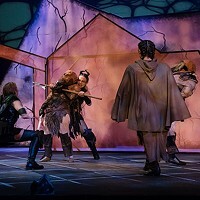 But Pittsburgh Musical Theater has revived Godspell in a new way: Instead of the hippie rock opera of the '70s, this updated version takes place at the foot of the New York Stock Exchange. Instead of goofballs in big pants, this teen-age ensemble wears super-hip club gear, like the survivors of an exploded H&M outlet. Instead of a brown Afro and a Superman T-shirt, Jesus sports blue jeans and a California Angels baseball shirt. (Get it?) To combat adolescent ADHD, video is projected in the background, showing multi-ethnic faces and American flags and mushroom clouds. And stuff. 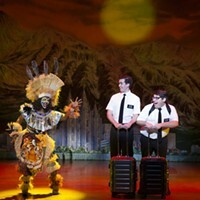 Since PMT is an after-school academy, grooming the Broadway stars of tomorrow, its musicals are usually carbon copies of the New York originals. But Godspell's ultra-modern veneer is something different: The dialogue is rife with celebrity impersonations (Bill Cosby, Sarah Palin, Christina Aguilera) and snippets of chart-topping pop-songs ("Oops, I Did It Again," "You're Beautiful"). This is the Gospel by way of the Jonas Brothers, a subversive Echo-Boomer revue that both relies on VH1 culture and mocks it at the same time. The recipe is convoluted, but then again, it always has been. Unlike Hair -- the other "American tribal love-rock musical" -- Godspell isn't trapped in the Vietnam era. Godspell productions have been set in construction sites and in outer space; how much more meaningful it is in the here and now. Ken Gargaro directs a talented, dedicated cast. As Jesus, Peter Matthew Smith is a soothing, good-humored presence. As Judas, Scott P. Sambuco is remarkably funny. Leah Zahner has the privilege of soloing "Day By Day," Godspell's only lasting super-hit, and she belts it beautifully. Take it from a heathen: I'd take this Godspell over church any day. Godspell continues through Sun., April 26, Byham Theater, 101 Sixth St., Downtown. 412-456-6666 or www.pgharts.org. The fashion of the Christ: Peter Matthew Smith portrays Jesus in Pittsburgh Musical Theater's Godspell.